Whether playing keyboard or guitar, hosting/emcee, providing/engineering sound, providing live or recorded music, Chris Taylor will add the right atmosphere to your business event. Chris is also a professional emcee and brings over 30 years of radio broadcasting that allows him to work an audience with ease and professionalism. * In-store, and corporate services start at $100 per hour which includes travel, set-up, and tear down. For more information call 503.421.6727 or fill out the form below. One of Chris’s favorite venues to play is in your living room or garden. The intimate and casual setting puts your guests at ease for a fabulous time of entertainment. * In-house concerts start at $300 which includes travel within the Portland/Vanc/Metro area, arriving 2 hours before performance to set-up, do sound check, and possibly rehearse with other musicians who might be performing. Most in-house performances last around 2 hours total. For more information call 503.421.6727 or fill out the form below. Chris Taylor runs a sustainable Mobile DJ company. Most music has been digitally downloaded using Apple iTunes along with Torq software using an M-Audio digital mixer instead of burning CD’s. 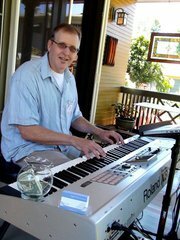 Chris Taylor services the Portland/Vancouver area, but is willing to discuss travel for your event. Clients include clubs/churches singles/couples dances, Portland Public Schools, hundreds of weddings, socials, and carnivals. Chris Taylor specializes in theme-based events such as: Sock-hops, Big Band/Swing, Retro/Disco, Beach Party, Father/Daughter dances, with music from big band to early 2000’s. * Mobile DJ prices start at 2 hours $295, 3 hours $395. For more information call 503.421.6727 or fill out the form below.